Hi. The MCT team is sharing Day 1 sneak peeks of the 90th Edition release. Happy birthday. Celebrate your day. For the background water and for the flamingos, I used distress oxide inks along with makeup brushes for blending. I used a snow pen to create a foam look to the water's edge. We will be giving away the sets we are showcasing each day to ONE lucky winner! 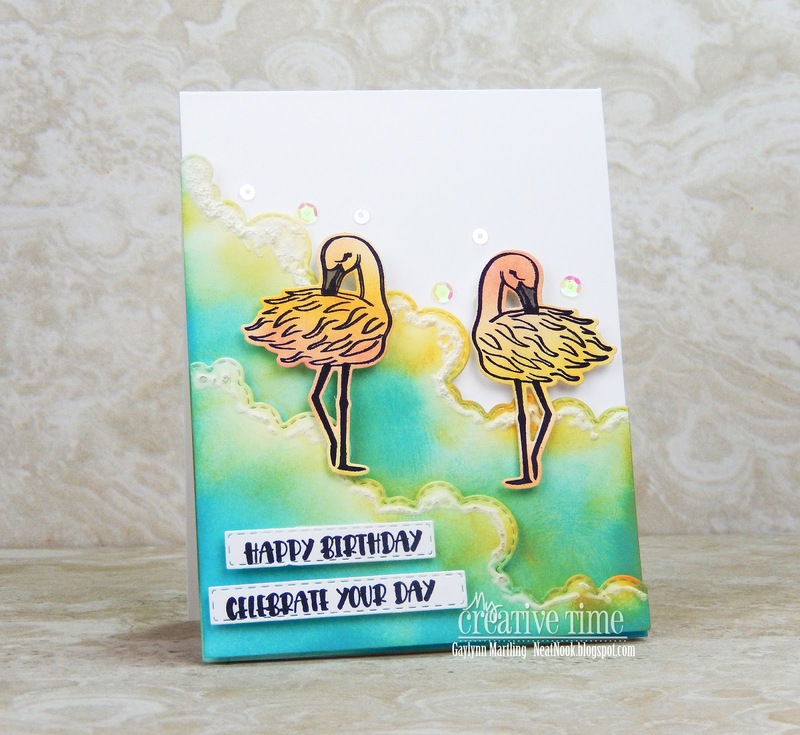 For example, the set we are showcasing on Wednesday, Emma will announce the winner of that on Thursday and the sets we are showcasing on Thursday, Emma will announce that winner on Friday on the MCT blog! ALL you have to do is leave a comment on each of our blogs! You are NOT required to comment on EVERY SINGLE blog, but the more you comment on, the more chances you have for winning! VERY IMPORTANT, PLEASE leave a way for us to contact you w/your comment just in case "YOU" are the lucky winner! For EXTRA entries, you can spread the word about this release on Facebook, tweet about it OR even Instagram it! #mycreativetime! GOOD LUCK EVERYONE and let's start spreading the word! Supplies: My Creative Time Hello Gorgeous, Strip Sentiment Dies and Floating Clouds Dies; Ranger archival ink and distress oxide inks in spiced marmalade, worn lipstick and broken china; sequins, makeup brushes, snow marker and mini Misti. Remember to comment all week for prize chances. OMG Miss Gaylynn What a Gorgeous Card!! Your Sky looks beautiful and so showcases your Precious Flamingos. You so did a Super Incredible Creative Job!! YOU SO ROCK!! WOW!!! Absolutely beautiful card!!! I immediately thought of the waters edge when I first saw it! Wow! It's so beautiful!!! Stunning colouring!!! Awesome colors on your pretty card! 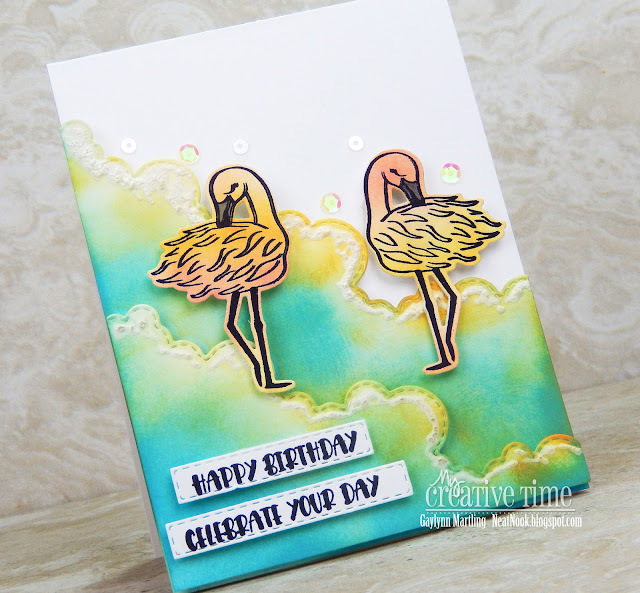 Love the cute flamingoes and the strip sentiments! Great new sets!